My 11 year old is developing an increasing interest in shopping malls. She enjoys the whole experience – going from store to store smelling candles and lotions, trying on clothes in the fitting room, and snacking on a pretzel from the food court. I can see slowly but surely how she is becoming a …. consumer. Although I feel like it’s still under control, I’m also concerned how important malls and purchases are becoming for her. So what better time to address these concerns than the holidays? Giving – rather than always receiving — to make a difference for someone or something is important to learn at an early age. This practice can become an integral part of a person’s lifestyle that extends beyond the holidays and well into adulthood. When first introducing your child to the idea of giving time and/or money, definitely let him or her have a huge say in the matter. The idea will be more successfully and enthusiastically executed if your child chooses the cause or program themselves. What gets them interested and excited? My younger daughter loves the endangered animal, the red pandas. We recently went to a red panda event at our local zoo where many conservationists were on hand to explain their efforts. She instantly wanted to donate money to help with their conservation plan and also reach out to others (family and friends) to encourage them to donate as well. Other ideas include asking a local animal shelter if they need help walking dogs, socializing animals, cleaning cages, or collecting towels and blankets for the animals. Maybe your children would like to help the environment; there are many sources online that they can get involved with – from donating money to helping with local clean-up efforts. They can start a school program to donate food and/or clothes to a charity or to help those who were affected by a natural disaster. But when deciding on the right project to pick, be sure to keep it age-appropriate. 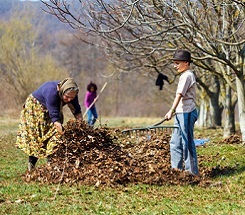 For younger ones, the time frame may need to be shorter and the amount of manual labor kept to a minimum. So projects such at a local food pantry, where the kids can do tasks such as counting and sorting is great. Another option is to have them go through their books, toys and clothes to see what they would like to donate. Older kids can take on more, but again you also don’t want it to be overwhelming. For example, they can volunteer with community gardening projects, help build houses through Habitat for Humanities, or coordinate and implement a neighborhood or school recycling program. Also bear in mind that the act of giving does not necessarily have to be tied to a huge cause or established program. For example, they can help an elderly relative or neighborhood by cleaning their home. They can go to a nearby park or beach with you and pick up trash. They can purchase school supplies and donate them to their class. Recently, my daughters’ school had a “beautification day” and kids came out and helped sweep hallways and trim plants. Whatever the choice is, the important thing is that your child is helping and giving their time. Like most things you do as a parent, you’re setting an example for your kids. If they see you volunteering your time, effort and money, they’ll likely do the same as adults and parents someday. Similarly, if you seem annoyed or bored with the volunteer time or when making donations, they probably will react the same way as they volunteer or not bother to volunteer or donate at all. In addition, work with your child as they are volunteering or perhaps match your child’s donation amounts. He or she will not only love the time – side by side – that you’re spending together to reach these goals, but also notice that what you’re working on is important to both of you. By donating their time and money, kids take focus off themselves and also get a better sense and awareness of what’s happening around them – in their neighborhood, at their school and even around the world. Their efforts also can help inspire your kids to be compassionate people with a wonderful sense of empathy and tolerance. The spirit of giving can also motivate your child at home; skipping items at the mall and instead, giving of themselves at home – folding laundry, clearing the dinner table, raking leaves and taking out the garbage. These are all wonderful “gifts” that I love receiving. Happy Holidays!